Voodoo Dreams Casino is powered by NetEnt and Yggdrasil, which means you can look forward to a massive selection of casino slot games, table games and enthralling video poker. Established in 2016, Voodoo Dreams Online Casino is owned by Suprnation Limited and licensed and registered by the Malta Gaming Authority and the UK Gambling Commission. All the games at this online casino can be played through instant play, and mobile games are supported, too, so you can have all the fun on the go. As the name suggests, this is a voodoo-themed online casino so there’s certainly an atmosphere of magic and excitement in the air when you sign up. Even your player rewards are referred to as spells. The actual site is adorned in colours of turquoise and black for an ultra-modern gaming. Head over to the site’s homepage and you’re greeted with the casino’s logo in the top left menu along with an easily navigable long top menu that displays all the games, including live games, table games, slots and jackpot games. You can get to the slots from the graphics below the menu, which makes it really easy to browse Voodoo Dreams Casino’s entire gaming collection just by scrolling down your screen. This site’s help and offers sections can be accessed from the menu on the bottom left-hand side and new players can look forward to free spins on sign up along with some awesome welcome bonuses. Once you sign up at Voodoo Dream Online Casino, all you have to do is cast your spell and you’re on your way to a winning streak. In theory, anyway! The operators behind this online casino have years of experience in the online gambling industry, so they’ve set out to create an incredibly unique gaming experience including a player’s dream combination of a user-friendly website, great games, a well-thought-out loyalty programme and seriously magical rewards. When it first opened its doors, Voodoo Dreams Casino was only licensed by the Malta Gaming Authority, which meant it didn’t accept players from the UK. Fortunately this changed in 2018 when the operators were granted a license by the UK Gambling Commission. So, UK players, that means you can now enjoy all the magic of Voodoo Dreams. Which means it’s time for us to see just what this online casino has to offer our players. If there’s just one word we can use to describe the Voodoo Dreams Casino welcome package, it’s got to be “outstanding.” While the bonus wasn’t initially available to UK players, it is now and that means you can avail of a super-magical $/€1,000 bonus and 200 free spins to play on NetEnt’s much-loved Starburst online slot. Get 100% match deposit bonus up to $/€100 on your first deposit along with 200 free spins to spend on Starburst, Aloha or Lights online slots. Get another 100% match deposit bonus up to $/€300 on your next deposit. Get 50% up to $/€300 on your next deposit. To be eligible for the welcome bonus and free spins, you need to deposit a minimum of $/€20. What’s more, your 200 free spins that you get with your first deposit are credited in sets of 20 free spins over a period of 10 days once you sign up. If you want to withdraw your bonus or winnings, you’ll need to playthrough the bonus 40x as well as your winnings 40x and there’s a maximum bet of $/€5 for wagering requirements. Several games are restricted for bonus play, including Castle Builder, Tower Quest, Dr Jekyll & Mr Hyde, Super Monopoly Money, Untamed Crowned Eagle, Divine Fortune, Double Dragons, Koi Princess, Robin Hood and several others. Be sure to read the terms and conditions to make sure you know what you can and can’t play for your wagering requirements! Voodoo Dreams Casino really knows how to look after its players. It updates its promotions regularly and there are also tournaments worth checking out. All you have to do is enter and play a duel. As you play duels, you’ll earn stars. Collect enough stars and you’ll make it to the top of the leader board where there is an array of prizes up for grabs. Experience Points: can be earned for every winning spin you get to work your way up the Voodoo levels. Each level unlocks four new rewards, or Spells. The higher up you go in levels, the more valuable and powerful the Spells. Spirit Points: are collected parallel to Experience Points and you can use them to cast or activate Spells (rewards). Spells: you can earn loyalty rewards at every level, which are divided into four categories: You start off on the level called Blood Magic where you get free spins for making a deposit. Next up is Dark Magic where you get a bonus for making a deposit. Then there’s Light Magic where you can get a larger bonus for making a deposit and finally Spirit Magic where you can get free wagers, cash credits or no deposit free spins. There’s no denying that this is an extensive online casino reward programme that ticks all our boxes in terms of levelling up quickly and getting better rewards as you progress. While there’s not much information available about Voodoo Dream’s VIP club, we have no doubt that they take magically good care of their most loyal players. The processing time for withdrawals in 6 – 8 hours and you’re welcome to cashout on weekends, too. The payout limit at Voodoo Dreams is $/€100,000 per month unless the casino agrees to a larger amount for you. Voodoo Dreams uses some of the biggest software brands in the industry, including Betsoft, NetEnt and Microgaming. In fact, there’s barely a popular provider not included in its list. This means there are more than 600 top-notch games split into different categories. Of course, slots make up biggest category, complete with a massive selection of themes and bonus features. Some of the most popular titles you’ll find at this online casino include Jurassic Park, Fruit Zen, Immortal Romance, Birds on a Wire and loads more. There are also plenty of progressive jackpot slots just waiting for you to work your magic on, such as Divine Fortune and Mega Moolah. There’s also video poker, a selection of popular table games and card games to enjoy. If you just love live dealer games, you’re going to enjoy the experience at Voodoo Dreams Casino. You can select the live casino tab in the top menu to open up the live dealer section. Here, you’ll find an array of common draw blackjack, roulette HD, blackjack, and French Roulette tables. There’s even a really handy and detailed guide on how to play live casino games at Voodoo Dreams. All the games at this online casino are available via instant play, and mobile games are supported, too. 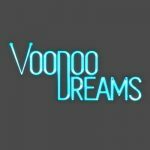 There’s no need to download an app for Voodoo Dreams, just open up your smartphone or tablet’s browser and head over to the main site. Log in and start having fun and casting spells! 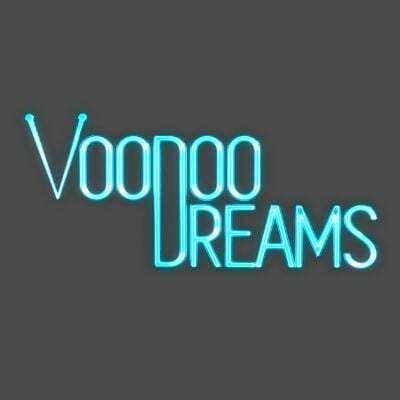 Voodoo Dreams Online Casino is licensed and regulated in the UK and Malta. That means there’s no room for foul play when you’re busy making magic. As a well-loved and highly reputable casino, you can rest assured that this operator employs the best-of-the-best when it comes to security technology and software to ensure your banking and personal data is completely safe and secure. The use of Random Number Generators and third-party audits also ensure that every game is fair. If there’s anything you need to know at this casino, you’ll find it on the side bar on the left of your screen. But, if you do run into any issues during gameplay or sign up, there’s a Help section at the bottom of the page. Click on that Help button and you’ll get another side bar on your right-hand side. This is your go-to helpline. But, if you need an actual person to help you out, there’s always the customer support team. While they’re not available 24/7, you can reach them via live chat or leave an on-site message for them to deal with when they’re online. There is no phone number on this site if you want to speak directly to a customer support agent. Would we cast our spells at Voodoo Dreams Casino? It’s a great, big yes from us! We’re bowled over by the site’s modern simplicity, clear navigation and excellent selection of games from all the big providers. The welcome bonus is magical in itself, not to mention the free spins and the wagering requirements are fairly standard. On the whole, Voodoo Dreams Online Casino will not disappoint new and avid UK online gamblers alike. The customer support lacks, a little, and the withdrawal methods aren’t varied, but when it comes to service, gaming and magical experiences, this is going to be the casino for you!